Bradford had a strong side on duty but the Rams matched them stride for stride in the first half and only trailed 8-6 at the break. Jake Webster twice went close as Bradford put the Rams under early pressure but the defence remained solid. Sam Day went close following a dart from acting half back before Dewsbury took a 12th minute lead as Kyle Trout stormed towards the line, spun in a tackle and got over the line, with Liam Finn adding the goal. The Rams thwarted another Bradford attack before former Dewsbury man Dalton Grant replied with a try on his first Bulls appearance of the season. A neat passing move ended with Elliot Minchella releasing the Welsh international winger to cross for the try but Jordan Lilley’s difficult conversion drifted in front of the posts. Bradford looked to take a grip on the game and it took a fine tackle from Luke Hooley to prevent Matty Wildie from scoring before Rowan Milnes chipped over the top but Finn was alert to clear the danger. 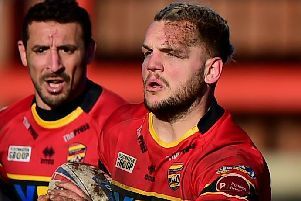 Dewsbury created chances of their own and Michael Knowles — back in the side for suspended captain Paul Sykes — kicked through but Jake Webster managed ton gather the ball. Bradford had Mikey Wood sin-binned for a high shot on Rob Worrincy in the build up to half-time and Dewsbury threatened again but Finn’s kick to the corner went harmlessly into touch. Bradford took the lead just before half-time when Grant out muscled Dale Morton on his way to the line but Lilley was unable to convert and the home side held a slender advantage at the break. Bradford took just three minutes after the re-start to extend their lead with a third try when full-back Ethan Ryan created good field position with a fine run before Milnes side stepped his way over. Minchella took over the kicking duties from Lilley and landed the goal to give the Bulls breathing space. Milnes fed David Foggin-Johnston, who dived acrobatically for the line but was judged to have put a foot in touch. Day went close at the other end but his run towards the posts was halted by a tight Bulls defence, with further Rams chances going begging when they lost possession. Minchella grabbed a crucial 65th minute try when he barged over in the corner and landed a superb touchline goal. Dewsbury were given a glimmer of hope as they grabbed a second try six minutes from time. Morton and Hooley linked down the right for the latter to cross and Finn converted. However, Bradford closed the game to prevent further Rams chances as they left Odsal empty handed.